Openmoko regularly releases updated versions of the Openmoko root filesystem, the kernel, and the Bootloader (called U-Boot) as binary images. These may be programmed into the Flash memory (NAND) of Neo FreeRunner. 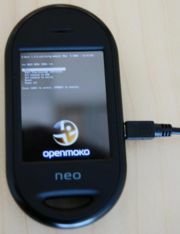 For that, you can use the USB cable and another computer which will run an Openmoko-provided tool to flash the Neo FreeRunner "through" USB. bootloader: a small program that runs first and starts everything else when the FreeRunner is powered on or reset (depending on how you reset it, the version from NOR or NAND is booted). kernel: the central component in the Linux operating system. root filesystem: contains all the files that make up the commands and applications that you can run. All software components in the FreeRunner are bundled together into binary images. The FreeRunner has two kinds of internal program storage: NOR flash and NAND flash. On a desktop computer when you want to replace the operating system (OS), you would boot it from a CD-ROM drive, then copy OS files from the CD to the internal hard drive. The FreeRunner does not have a CD-ROM drive and files must typically be re-written/flashed directly into internal storage (NAND flash). Alternatively, it is possible to boot from a microSD where all the files have been loaded onto. NOR flash is small and stores only a special boot program used when you need to re-write the contents of the NAND flash. Usually it is not necessary to re-write the NOR flash. Instructions to do so is here: Flashing NOR. NAND flash acts more like a hard drive. It is divided into 3 partitions for the bootloader, kernel, and root filesystem. Being on different partitions, each component can be flashed separately. For example if you are trying to install a modified kernel, you only have to follow the steps to flash the kernel image. You may install this distribution on the microSD card, in order to boot from microSD card. That allows you to keep another distribution installed in NAND (for instance to test 2008.08 while still having 2007.2 for default boot). Command-line. DFU-util, the tool to flash the FreeRunner has to be installed on you laptop or desktop machine. It is available for Linux, MacOS X, and Windows (see links below). DFU-util allows you to connect to the FreeRunner through the USB cable and control its bootloader. That connection uses a special protocol which addresses the bootloader's interface, and differs from USB networking. For more details, see the separate dfu-util page. Seek for 32-bit machine and do flashing form it. Use 32-bit chroot (on amd64 debian). Worked for me --Bubak 16:54, 4 September 2008 (UTC). Just try the 32-bit dfu-util. Worked fine on my x86_64 Fedora 10 --pcfe 2009-01-16. Virtual machines While there has been some limited success reported using dfu-util from within a Virtual Machine (such as VMware), in general it is not possible to use dfu-util in this fashion. You must use dfu-util on an operating system that has direct access to the physical USB device hardware. There are separate image files for all 3 software components and depending on what you want to install, you pick the respective image file. In most cases you will need to install a Kernel (uImage) and a Root Filesystem (rootfs). In rare cases, when there is a bug you need fixed, you will also install a new bootloader. Do not connect the USB cable from the PC to your Neo FreeRunner yet (disconnect it). Boot your Neo FreeRunner into the NOR uBoot menu for flashing. Stay in NOR uBoot menu, do not select or enter any item in menu. Now you will be able to flash, make backups of your FreeRunner or query the FreeRunner with dfu-util. Connect your Neo to the GNU/Linux or Windows host via a USB cable. dfu-util can be used to read flash memory, write memory, and get information from the device. On Linux, you run dfu-util from a command shell prompt. If you have not put it somewhere on your command path you probably need to prefix it with a "./" like this ./dfu-util. On some systems you need to be root before this will work and on Ubuntu you must preface the command with "sudo" or you will get the following error: "Cannot claim interface: could not claim interface 2: Operation not permitted"
On Windows, you need to open a command window and run from a command line. Use Start-Run Program and type "cmd" to open a Window. Note: The phone needs to be in the U-boot bootup menu for this to work. Get there by holding down the aux button while powering up the device. Flashing may fail with an error -110. This indicates that the kernel is too big for the default kernel partition. uboot can be used to change the size of the default partitions on the device. It may also mean that you are trying to put the wrong thing in the kernel space. | U-Boot where rootfs_filename.jffs2 is the name of the file containing the root file system. The flashing process can take up to 15 minutes for a ~70MB image. It is also wise to make sure that your Neo has enough battery charge prior to flashing. NOTE: In most cases you don't need to flash your bootloader. Flash it only if you want to update for a specific feature or due to a specific problem. The boot loader (U-boot) file should have a .bin extension. As with the root filesystem, if the file you downloaded is zipped or compressed (has a .gz or .zip extension) you have to uncompress it first. where uboot.bin is the name of the boot loader binary image file. Reminder: You should have boot from NOR first, in order to flash the boot-loader in NAND. After flashing succesfully, make sure you reboot from NAND's newly flashed boot loader, to benefit from the updates. You should now be able to boot into the new images. The boot menu should be labelled *** BOOT MENU (NAND) *** this time (see booting from NAND for more detailed instructions). In this case, we're looking for 'rootfs' which according to above is mtd6. If you have it somewhere else, substitute mtd6 with whatever you have in the remainder of this section. this method seems to not always work, also the -m flag tells nandwrite to mark blocks it detects bad as bad, so if nandwrite is bugged, your entire partition will be marked as bad. See http://wiki.openmoko.org/wiki/NAND_bad_blocks#Clearing_BadBlocks if this happened to you.